This is how it went, as far as I now to the best of my ability remember it. Almost 20 years ago I struggled to awaken the awareness of the public to the increased greenhouse effect. This was in the days when it was totally weirdo style to believe in such a risk! It was only the Green Party who did, and not even all among them. By the way, they were around 4% of the Swedish population, and I wasn't even a member yet. I had only seen an episode of "World of Science" (Swedish factual TV show) talking about this. With time, the awareness about the greenhouse effect slowly grew, and in the Green Party and other environmental organisations it became an established fact. Then I went to Chalmers University of Technology to study, and among other things learned, on a molecular level, how the greenhouse effect works. In a computer lab I for example learned that 95% of the greenhouse effect comes from water vapor, which regulates itself in the atmosphere. It surprised me to some extent that I had never heard this before. "Climate change - Science, politics or religion?" On top of showing how the "climate movement" actually resembled religion in a number of ways (the lurking doom's day, repent from sin and and you shall be saved, strong, charismatic leaders,...) he gave a few, it seemed to me, pretty strong arguments as to why the climate hysteria was exaggerated, and to how it was in fact technically impossible to foresee how the climate would change, regardless of what we did, or didn't do. When asked by a person in the audience what he thought we should spend our efforts on, he said that we should prepare ourselves for climate changes in either directions, since the only thing we could be sure of was that climate would always keep changing. 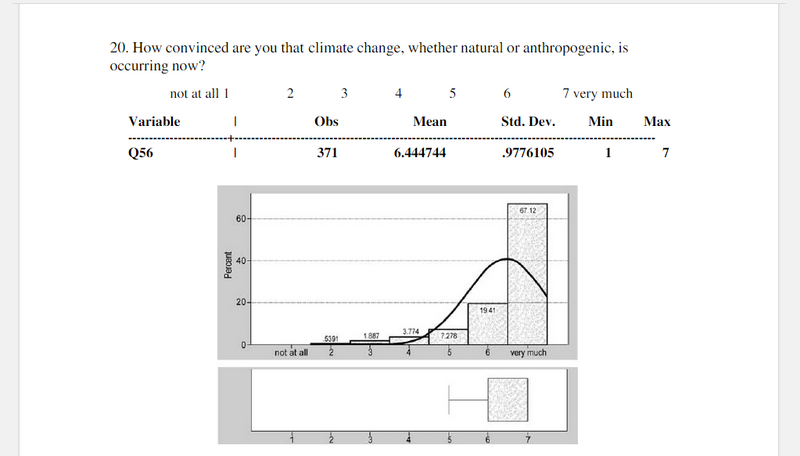 We were supposed to hand in some kind of summary of the lecture of one page, and so I handed in a page with what I thought were the strongest arguments for the climate hysteria being exaggerated. I got a vague and somewhat funny response from the examiner... She said, roughly, that it didn't at all need to be that way, and that many of my classmates were much more critical. (Which is a silly thing t say... To accept a notion that over-throws everything you've until now believed in and fought for does hardly make you uncritical! It makes you open-minded and very self-critical.) I got interested and asked her to send me these other students' papers so that I could read them. Then she said that she couldn't give out other students' work without their permission. So I asked her to please ask their permission. (Why wouldn't they give it? Wouldn't most of us only be happy if our work could be of interest to anybody, other than the teacher?) But she replied that I could ask them myself instead. But the course was over so I wouldn't see them again, and I didn't know their names and much less their e-mail addresses, nor did I know who had written about this particular topic! So I asked her if I could at least have their e-mail addresses then so that I could ask them, but I didn't get them. Weird behavior!! ...Wasn't it? Then in 2006 Al Gore's movie came, and suddenly the whole world turned around! This could have been happy days for me, when I finally obtained redress for all my thankless work... if only I hadn't just started turning around in the opposite direction. Figures! Quite soon I was made aware that Al Gore used of a gigantic presentation scam in his movie, which I recount here. (In short he talks as if the temperature curve follows the carbon dioxide rate curve, when in fact it is the other way around.) And you know, when somebody makes such a huge mistake, whether intentionally or unintentionally, it becomes hard to trust anything of what that person says. 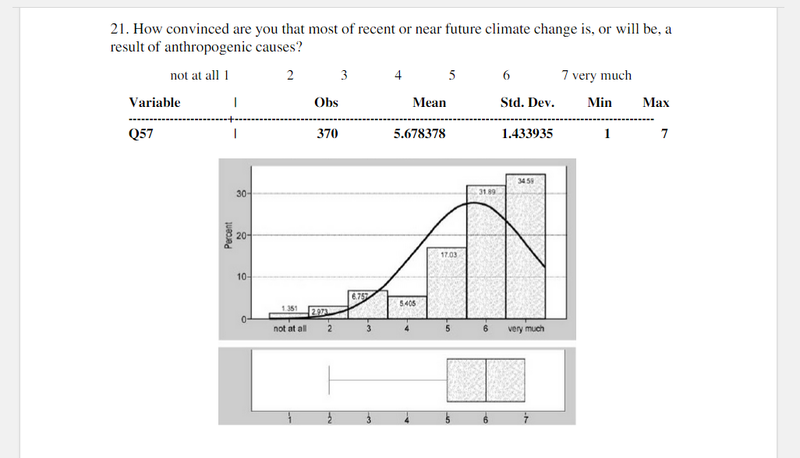 I now started pressuring all my tutors for an answer about how it really was with this climate change thing. Most of them said it wasn't their field. One of the tutors in the course where we handled the greenhouse effect said: "Well, it's hard to imagine what else could be causing it! ", which is about the same answer as believers in God gives to the origin of life... My master thesis examiner, Göran Petersson, turned out to be a convinced skeptic. Let me give you some background to Göran Petersson. He is now way above retirement age, but carries on working at Chalmers in what seems to be an unimpeded pace. He is a committed environment advocate! He is one of the few among my tutors who was consequently using his findings and expertise to try and influence the social development through debate articles, TV appearances etc. He rounded off his course plans by writing that if also it wouldn't go so well on the exam, we shouldn't let this bring us down. A life-long commitment could often be as useful to the environment, if not more, than the ability to cram large amounts of facts in a short time!... Meaning he assumed we were there in his course (of which at least one was compulsory) to save the environment, rather than to get good grades or a fine job! He encouraged students to do political activism in the university, and complained that there was far too little of that, these days. He was also one of those who killed the acidification hype. You see, a few decades before the climate beat, the acidification beat swept across Sweden. All environmental problems could then be blamed on acidification, which was very convenient since most of the acidification came from down the continent and the UK, and so we didn't have to change anything ourselves. Göran Petersson and his colleague Olle Ramnäs then walked in another direction and managed to show that the forest death that we observed to the largest part was caused by tropospheric ozone, from our own domestic traffic. If Göran Petersson was now a convinced climate skeptic, this was an opinion of grave significance to me. I went to some sort of panel debate at Chalmers... 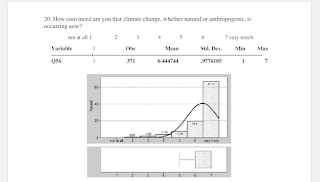 Some 6 or 7 researchers held a short presentation each about their work concerning the climate change. One of them was from the IPCC. All the speakers agreed in large about the climate threat, if they also had slightly different angles and figures. The audience, which consisted mostly of employees and students at Chalmers, was more skeptical. Several of them brought up the issue of Al Gore's turned around causality argument with temperature and carbon dioxide, and the man from IPCC said (revealing some impatience) that he couldn't understand what difference it made, since we knew that at least there was a causality relation in the direction that Al Gore said as well!... Which I found provokingly ignorant! On the whole, he was the one of them who made the most careless and unscientific impression. But this may have been because he was not a researcher himself... but only summarized research? This round of presentations anyway obviously didn't convince the audience, and it didn't convince me. Later, my supervisor in my master project, secondary school teacher and biogas expert Björn Martén, said that it probably was the nuclear power lobby that was behind the climate hype... Because the only thing that could quickly replace our present consumption of fossil fuels, without forcing us to cut down on our energy usage and thus our lifestyle, was nuclear power! My subsequent studies in the field has confirmed this. Top graph: Global temperature 10'000 years back, up until 1850. Bottom graph: Carbon dioxide rate 10'000 years back, up until 1777. Since the data above comes from ice cores, the last few hundred years are not there. 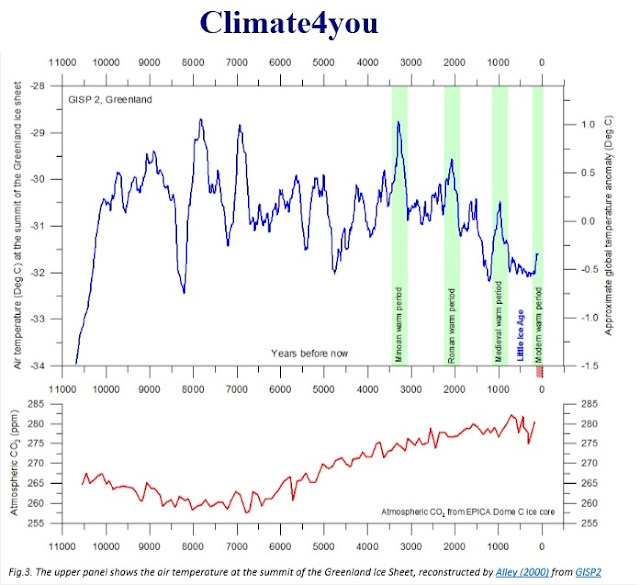 In the caption of the original graph you can read that the carbon dioxide levels have since then risen to around 395 ppm (which is way off the chart) and that temperature has risen to about the same levels as they were in the medieval warm period. Note that the normal state of the earth is ice age, with around 7 degrees lower temperatures than now. Note how well the temperature increase of the latest 100 years, up to medieval temperatures, blends in with the temperature fluctuations of all times, and doesn't look at all special. Note how the climate has been unusually stable for unusually long in the last 10'000 years, but how it has still fluctuated more in this time than what we've seen in the last 100 years. In the Minoan warm period, and twice before that in this 10'000 year period, it was 0.75 degrees warmer than now, and 8'000 years ago the temperature rose 2 degrees, just as fast as it is rising today. Note, of course, how the carbon dioxide curve, in this shorter time perspective than that of Al Gore, doesn't at all follow the temperature curve...! It seems highly uncertain to claim that that last 100 year temperature increase must be caused by the increase in carbon dioxide rate... I mean, what were all the earlier fluctuations caused by? Note how you can clearly see that even in the year 1850, where the ice core data ends, the temperature had already started rising!... Isn't that funny though? The industrial revolution had barely even started in 1850, so the temperature increase began BEFORE the industrial revolution!... In fact, even the IPCC says that up until 1915 the concentration of anthropogenic carbon dioxide and other green house gases could hardly have had any effect at all. That's more than 100 years after the temperature started going upwards. 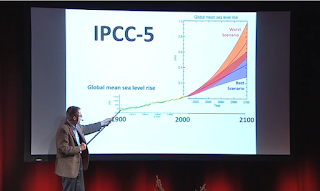 In reports and presentation materials, the IPCC, without exception, make all their graphs about the last 100 years (which are not seen above). To show these last 100 years, without putting them into the above perspective, seems to me like severe misrepresentation of data. I went to a Green Party congress a few weeks ago. Greenpeace was there! They were lobbying for us to support a motion to use our governmental energy company to phase out brown coal mining in Germany (because a Swedish government owned company owns the power plants there) which I supported. I took the opportunity to discuss the above images with some of them. To my grief they were all totally confused, and said that this was not consistent with what they had previously seen. Which could be explained by them previously only having seen Al Gore's temperature and carbon dioxide curves over 650'000 years, and IPCC's many graphs concerning only the last 100 years. 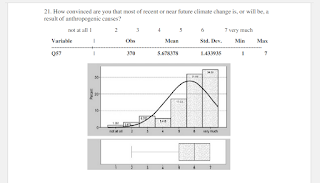 I asked the activists if they knew how large a part of the total greenhouse effect that was caused by water, but they had lots of trouble even understanding the question, and when they did they had no clue of the answer. 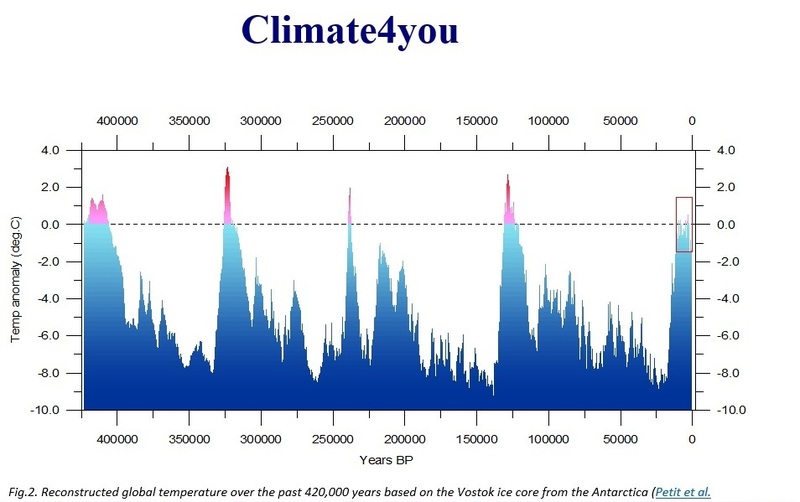 I also spoke to another Green Party member who said that he had heard that the temperature was higher now than in millions of years before, which you can see is absolutely not the case!!... Even if the temperature should rise the predicted 3 degrees in total, it would make it higher than in the last 10'000 years, true, but not higher than in the last 420'000 years. Should it go up 5 degrees it would be. Then maybe it would be higher than in millions of years. But do we really know that this will happen? What??!! But that's not at all what the graph is showing!! The graph only shows that the climate is changing, not that it is the humans who are making it change! Maybe he is not basing the conclusion on the graph but on something else entirely, but on what then, and if so, why does he say "as I read it"? Clearly the most likely interpretation at hand to the listener must be that he bases the conclusion on the graph he is showing and talking about, and if so the conclusion is all wrong! Because as we have seen, climate has always been changing, and the last 100 years are not at all unusual. The rest of the video presents, in itself interesting, statistics about energy consumption distributed over different sources of energy and over different income groups in the world, but this I already know. Here is a survey, found via the above article, which clearly shows that the degree of agreement is far below 97%. More precisely, the scientists were very sure that we have a global warming going on, but far less sure that humans cause the larger part of it. "Yeah, I'm also starting to accept this now... Up until now I have been feeling that 'Wait until the trial is over, he is only suspected with reason yet', but I'm also starting to believe now that it is actually him..."
It was only a day or two after this conversation that this person was released, and a totally different person was arrested, as "suspected with probable reason" (another translation by me), which is much stronger, and later was also convicted!... If you wish to be conspiracy-theoretical you might suspect that this first person, who received some damage compensation for his trouble, had been held in arrest just to keep the population calm and happy while they were looking for the real murderer! Well, it feels the same way now. Everybody is convinced of what is about to happen, but nobody can present any evidence for it. And I don't want to fall for it again, and start believing it me too, without evidence! So please, is there anybody who has evidence? NOT showing that the temperature has risen over the last 100 years, I already know this, but that it is somewhat certain that it will continue to rise with a total of 3-5 degrees due to anthropogenic release of greenhouse gases! If so, please show them to me, I ask.